In the 1980s, as comics readers grew older, fans started calling for more sophisticated stories. They were also no longer just following the adventures of popular characters; writers and artists with distinctive styles were in demand. 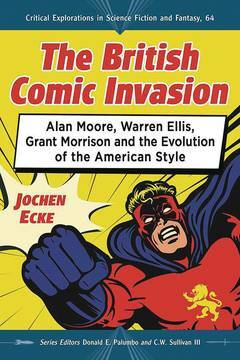 DC Comics and Marvel went looking for such mavericks and found them in the United Kingdom. Creators like Alan Moore (Watchmen, Saga of the Swamp Thing), Grant Morrison (The Invisibles, Flex Mentallo) and Garth Ennis (Preacher) migrated from the anarchical British comics industry to the U.S. mainstream and shook up the status quo yet came to rely on the genius of the American system.. Publisher MC Farland & Company Inc.